These clea eating marshmallows are delicious in every way! When I found this video, I did the Snoopy Dance all over my living room. I may have even done a “Tom Cruz” on my couch. I’m not sure. My memory is conveniently fuzzy at the moment. Recipe and Video Copyright: VolcanicNectar.com. Shared with permission. Admit it. You just did a little Snoopy Dance in your chair. Here’s the recipe in case you didn’t have a pen and paper handy during the video. 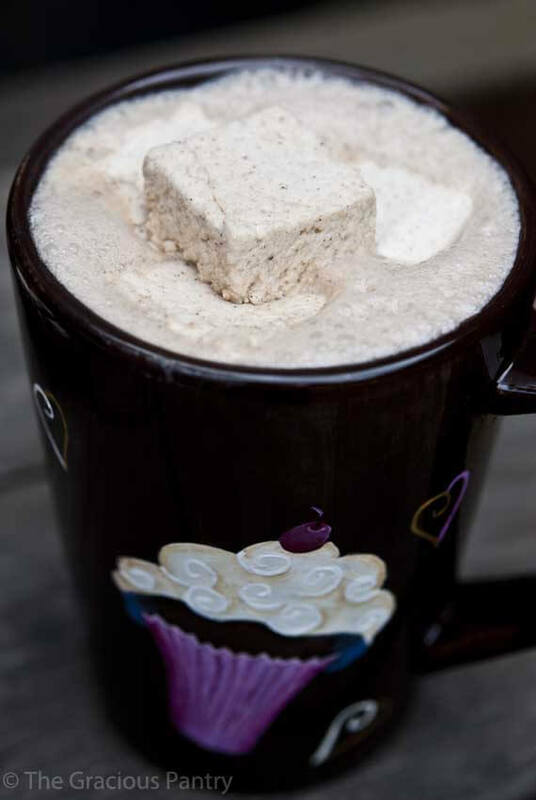 Also check out this recipe I did as a guest post for Pumpkin Spice Marshmallows. Yum! Please Note: The type of gelatin you use makes a difference in how healthy they are. Gelatin has many health benefits if you use the good quality stuff. I found this brand and have enjoyed it quite a bit. Also, the video below is to show the technique for making these. However the use of agave is not clean as agave is highly processed. So the recipe below calls for honey instead. Need some help choosing the right gelatin? This article is very helpful. Made with or without pumpkin pie spice, these marshmallows are clean and totally delish! Stir gelatin into water in a small bowl. Microwave for 30 seconds. While that's in the microwave, pour your honey into a mixing bowl. Blend for 12-15 minutes until the mixture is white and fluffy and has quadrupled in size. Coat a casserole dish with cornstarch. Scoop marshmallow mixture into casserole dish and smooth top so it's level with a spatula. Let sit for a minimum of 3 hours. Overnight is best. Turn out onto a surface dusted with cornstarch. What a great recipe! 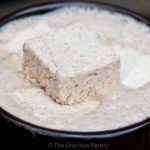 I can’t say that I’m a huge fan of marshmallows but I LOVE the idea of them sweetened only with agave. Definitely a a great ideas for clean eater’s who love them. And so much better for the kids!! Thanks for sharing. I’m glad you enjoyed the post! This recipe is definitely better for kids. Perfect for this time of year too! I am so excited by this post!!! With summer here I have been craving a way to make smore’s with little guilt. Now just figuring out the grahamcracker aspect! Carthey – I’m working on a graham cracker recipe. Hope to have it out soon! Hi Tiffany! Any idea how this could be transformed into a marshmallow fluff recipe? I have a friend who loves fluff as a fruit dip, but the store bought stuff is so awful, and this recipe is so easy! I was just curious! Thanks! Court – Fluff = chemicals. I can try to figure something out, but I’m not sure it’s possible. I’ll try though! I was thinking maybe less gelatin, and more liquid, but I don’t know! I will have to try when I get home I suppose, I personally won’t touch the gross stuff, but a friend asked for help, so I figured I would ask! Thanks again! Charlena – I tried it once and it was an epic disaster. But at the time, I didn’t understand how to work with agar-agar. Now that I have a better understanding, I may try again. But I think that agar-agar produces something that won’t be as light and “fluffy” as gelatin. I’ve never tried kuzu root. I’ll keep working on it! Oh wow! This just made my life! Now i can have something in my hot chocolate this winter. !! CB – Enjoy! I recently found out that gelatin is not exactly clean. BUT, this recipe is FAR healthier than anything you can buy. So it’s a good way to splurge. Have you tried using these in place of marshmallows in any recipes? I’d love to make some healthy “Rice Krispy Treats” without having to using any nut butter– my daughter and I LOVE peanut butter but my husband… does not 🙂 I am wondering if I can use these marshmallows instead??? Maryellen – Wow. I can’t believe I’ve never tried! I’m so sorry, I wish I could tell you. I may have to try that soon to find out. Ashley – Agreed. I would love that. But at least these are bit healthier than the regular ones. Stephanie – Let me know! I thought about it, but since the marshmallows aren’t technically clean, I thought the better of it. Does sound yummy though! Here’s a thought: what about boiling up some marshmallow root power or even just shredded marshmallow root and using the filtered mucilage that results, considering that the gelatin was a replacement for the marshmallow root. Just be aware that the marshmallow root will coat your stomach and may slow or stop the absorption of any medications you take for a few hours afterward. OW – Now that’s an interesting suggestion! Might have to try that, thanks! Amber – Ya, these are not normal marshmallows with tons of preservatives. I wouldn’t keep them longer than a week. You could try freezing them, but I’m not sure if that would work as I’ve never tried. Ya, you just want a regular mixer for this one. Sorry. Good news is, the little hand-held mixers are cheap at Target. It’s not about the source of the gelatin (although that plays a part), it’s about the process it goes through to become the powdery stuff in the package. These look fabulous. Going to make them into marshmallows and also make rice crispy treats with puffed quinoa. Penny – I’m in Ireland right now, so hopefully somebody will be able to tell you. If not, email me and I’ll check it out when I get home. I used 1/3 cup (warmed) frozen raspberries and 2/3 maple syrup (in place of honey or avgar)and made raspberry marshmellows. Yummy! Lisa – Oh my! That sounds crazy good! I am new to clean eating and I love your website! I was just wondering why agave is not clean? There is grass-fed bovine gelatin that is clean-eating, even my strictest GAPS friend uses it: Great Lakes brand. You can buy it on Amazon. It’s actually a great nutritional supplement for joint health (and high in protein). Be sure to buy the red one, the green one won’t “gelify” (it’s really just considered a supplement). Eva – I’ve been meaning to do more research on this. I know that mainstream gelatin is highly processed. But I know there are better ones on the market. I’m just not sure how they are made. I’ll definitely check it out! Thanks! Loved these marshmallows! I did learn an important lesson, though: gelatin based marshmallows will not toast! They just melt and caramelize. Still worked out in the long run for the recipe I was making, but not as initially intended. Hi, I really want to make this but my son is allergic to corn so I can’t use cornstarch. Also allergic to wheat, coconut and tree nuts so not sure what flour I can use to help them not stick (and also not taste nasty). Do you have any ideas? Thanks! Mandy – Can you have arrowroot powder? Do you think adding less gelatin or not allowing it to sit out would create marshmallow fluff? I’ve searched and searched the Internet for a clean version and there’s one on Pinterest, but they use a specific type of gelatin and I’m wondering if just using unflavored like you did would create fluff. Any ideas? If you want to keep it healthier, you could experiment with melting them down and adding a bit more honey. I haven’t tried it, so I don’t know if it would work. But it’s worth a shot! I’ll add it to my list to try as well.